Want to see a magic trick? Pick a color, ANY color! Any Interior Decorator or novice home decorator will tell you that paint “makes it” or “breaks it.” Honestly. When I first purchased my home it had bright bold colors and faux finishes on the walls that made it hard to see the potential the house had. I think the home’s decor and colors deterred a lot of buyers, and I have a feeling that is why it was on the market for quite some time. Just remember that paint is cosmetic, and can always be changed. My advice to you: when you go to a home, try to look past the old color, mentally remove their furniture, and envision something completely different- you’ll be in good shape! 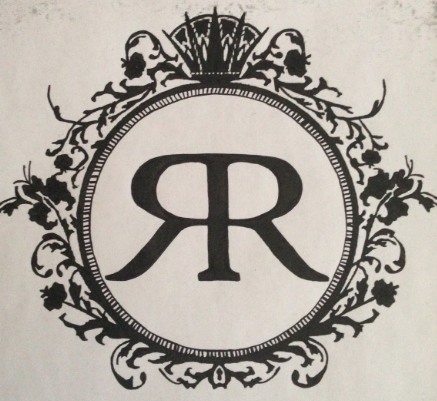 However, if you don’t have taste or style and like that sort of ridiculousness- then there is no hope for you! Anyway, once you get the home, and you pass papers and all that headache…. it’s time to create your color palette! 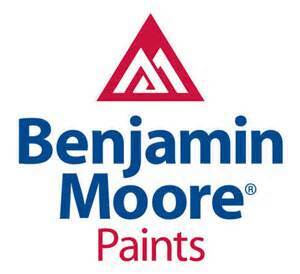 Know upfront that I ONLY use Benjamin Moore for home interior and exterior. It’s just a far superior paint, covers very well, and is an exact match to it’s sample. 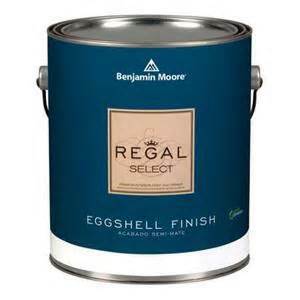 When doing interior walls, I almost ALWAYS choose an Eggshell finish. Personally, I think it is very important to keep the rooms flowing together; separating them too much with contrasting colors makes a home look choppy. One way to keep things consistent is by choosing one color and using the variety of shades on the same strip. The colors will go up or down a degree, but don’t divert too far from the original. Another option is picking a solid base. What I mean is- if you want to do creams make sure that all your colors have a cream base… don’t mix a cream room with a blue based room and then a green based room… too confusing! All in all, the key is to getting them to look good together. However, if you are like me…. then you pick a sh*t ton of samples, and don’t know what you want to do…. I like to lay out the floor plan- in this case upstairs and downstairs. 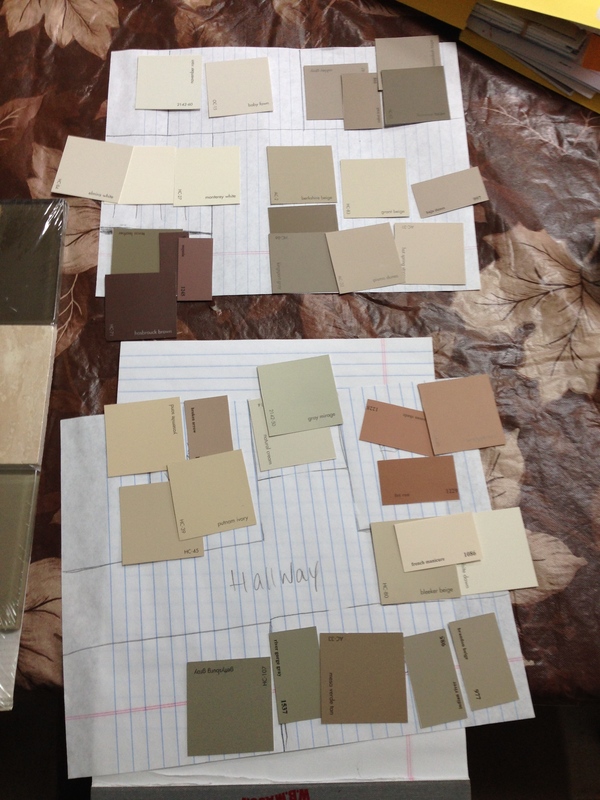 By laying out the floor plan, I can easily visualize what the colors will look like going from room to room. They are also easily moveable, and I can toss them around until I get the desired look. This may take YOU two minutes, this unfortunately takes ME days because I keep going back to the paint store for more samples, but I know how to pick paint- i’ll tell you that! Sometimes I get ahead of myself, so I’ve decided to focus on the downstairs first, get the paint on the wall, and re-group. Here is what I have come up with so far…. They all look really good together. Although they have the same taupe/cream undertone they provide each room with its own unique look. I will keep you posted as we start to paint, and I’ll be sure to share pictures! Once I get the upstairs figured out I will let you know- back to the drawing board, here goes another two days! Behind, in front, can’t get around the candelabra! In the post there is an image of all the colors on a piece of paper played out like my floor plan. They are all Benjamin Moore!